Jeremy is nervous starting school. Every time he thinks he can't join in they say Of Course You Can! So he plays football, joins in kapa haka and runs the cross country. But when it comes to swimming the other chlidren tell him not to do it. English/te Reo Maori text, retold by N... read full description below. Jeremy is starting a new school. He is a bit nervous and a lot worried but the children in this class are welcoming. Every time he thinks he can't take part they say 'Of course you can!' and so he plays soccer, joins in the Kapa Haka and even takes part in the cross country ... But when it comes to swimming the children tell him not to do it. Told in both Te Reo Maori and English. Karen Hinge was raised as a 'free-range kid' in the Waikato. Her childhood memories include long days of freedom spent bike riding, hut building, hill sliding and blackberry picking. She began her teaching career in Christchurch and enjoyed exploring the amazing South Island during holiday breaks. She now lives in beautiful Northland where, for the last 20 years, she and her partner Derek have been raising their family of three children. An intermediate school teacher, Karen says she loves the learning opportunities that teaching brings. 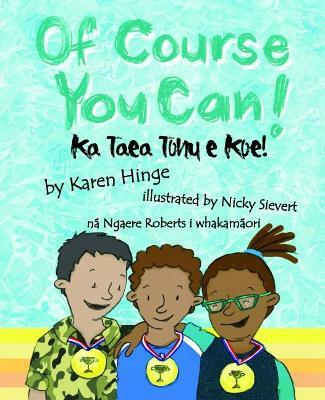 Ngaere Roberts has retold an impressive list of much-loved titles, mainly drawn from Scholastic NZ's list. Some of her retellings have been short-listed for awards in their own right. Ngaere has worked in the field of researching, promoting and developing te Reo Maori oral and written language since the 1940s. Nicky Siever is a budding writer/illustrator of books for children. This is her first book.